Product in Focus - Learn and Win! For your chance to win one of ten $50 Prezzy cards simply watch the video below and answer the questions at the end of the page. Entries to this prize draw close 30th September 2017, and winners will be drawn on 14th October 2017. Remifemin® is a natural herbal product used for the relief of the symptoms of menopause. Remifemin® contains a plant extract used by millions of women around the world and is a result of more than half a century of medical research. Remifemin® is recognised as one of Germany's foremost natural products made specifically for women's health at the age of menopause. The period leading up to menopause, or the transition to menopause is a stage that can begin several years before menopause. Everyone has different symptoms at different times (and at different ages). While every woman will experience perimenopause in her own unique way, the transition Is often characterised by erratic periods, hot flushes, night sweats, irritability and mild anxiety. This refers to your final menstrual period. The menopause itself is said to have occurred after 12 consecutive months of no periods. The above symptoms are often present during this time too, although often less intense. This term refers to the time after menopause. Some menopause related symptoms may still occur. Is Remifemin® the same as Soy or Red Clover? In contrast to soy or red clover, Remifemin® does not contain any phytoestrogens. Phytoestrogens such as isoflavones are known to mimic hormones and can lead to some nasty side effects similar to those of HRT. Remifemin contains a high potency, standardised extract of Black Cohosh which has been heavily studied for over 60 years and proven to provide safe and effective relief of menopausal symptoms. 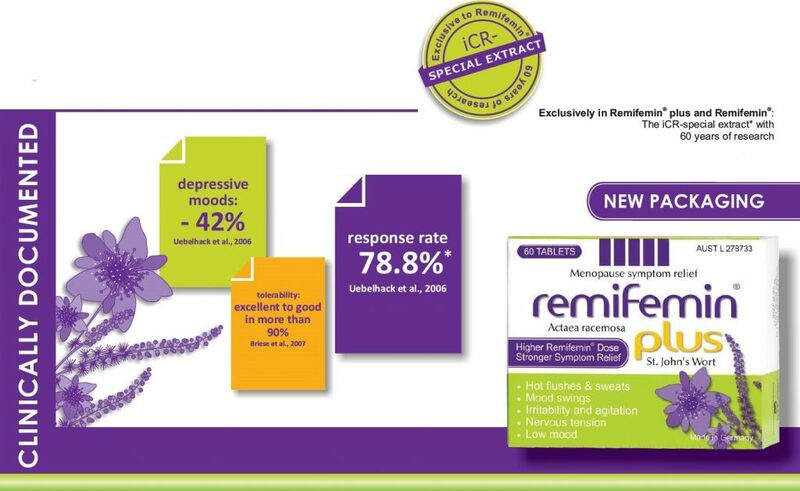 What is so special about Remifemin®? Remifemin® is a proprietary extract from Cimicifuga racemosa that has been available since 1956 and the subject of numerous medical studies. Remifemin® does not contain phytoestrogens and does not exhibit oestrogen-like effects. It represents a natural alternative for women experiencing the uncomfortable symptoms of menopause. As with most medicines the effectiveness can vary from person to person. Some women have experienced excellent results during the first two weeks, whilst others have reported more relief after four weeks. For the best results Remifemin® should be taken for at least twelve weeks and then continued if it provides the desired level of relief. What is Remifemin Plus St. John's Wort? Remifemin Plus St. John’s wort is a new product in the Remifemin range which is formulated for women experiencing severe symptoms of menopause often experienced during peri-menopause such as intense hot flushes and night sweats. Along with an increased amount of the proprietary extract of Actaea racemosa (Cimicifuga racemosa/black cohosh), Remifemin® Plus also contains St. John's Wort to assist with psychovegetative symptoms such as low mood, nervous tension, irritability and agitation. 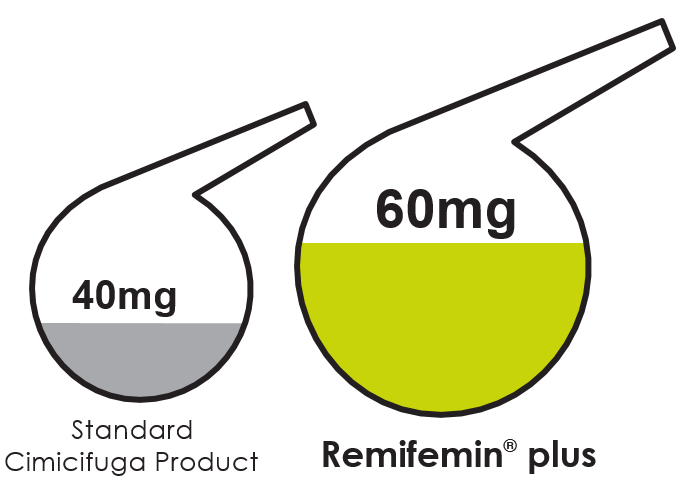 version of the original Remifemin®. Along with an increased amount of the proprietary extract of Actaea racemosa (Cimicifuga racemosa/black cohosh), Remifemin® Plus also contains St. John's Wort to assist with psychovegetative symptoms such as low mood, nervous tension, irritability and agitation. for women with stronger symptoms of menopause and/or mood related symptoms arising out of menopause fluctuations. for the earlier/peri-menopausal years to assist with getting symptoms under control from the beginning or for any woman who is experiencing more intense physical or emotional menopause related symptoms. 2 x 1-2 coated tablets am and pm. The best documented Cimicifuga extract worldwide.